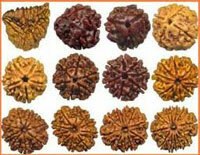 Rudraksha is a seed of a fruit from trees grown in INDIA, NEPAL AND MALAYSIA. Rudraksha are the beads with a purpose. These have powerful Electromagnetic properties in controlling stress, blood pressure, improves blood flow and circulation. Rudraksha beads have many powerful properties in transforming one’s personality and outlook in appositive way. Its a proven fact now that rudrakshas possess powerful electromagnetic, paramagnetic and inductive properties and thus on wearing these rudrakshas specific electrical impulses are sent to brain stimulating certain positive brain centres thereby causing transformation in the personality, outlook, charisma and confidence of the wearer. Its also a proven fact that rudraksha beads controlled heart beat and thus coordinations the blood flow to the brain. In eastern cultures, these beads are believed to possess supernatural powers. Thus, Surely rudrakshas are the wonder beads helping us perform better and lead a more successful life. Two naturally joined Rudraksha are called GauriShankar Rudraksha. It is regarded as the unified form of Lord Shiva and Parvati. It helps to improve relationships between Husband-Wife, Parents- Children, Friends and relatives. It is regarded as the Rudraksha for peace and comfort in the family. If a person worships Gauri Shankar at his / her puja place the pain and suffering and other earthly obstacles are destroyed and the peace and pleasure of the family are enhanced. Those desirous of finding the right life partner or couples desiring a child may wear this Rudraksha forpositive results. Commonly found 3 mukhi Haridwar variety does not have a natural hole but it is regarded as a genuine bead a medium quality. It is found in a oval shape and has lower a lighter density. Nepal variety although not very rare to find is nearly round in shape and the surface is smoother and harder than haridwar variety Seed Mantra :Om Hreem Namah This Rudraksha is blessed by Lord Agni (Fire God). The way fire consumes everything and remains pure, the wearer too gets free from sins and wrongs. Ideal for those who suffer from mental strains, inferiority complexes, subjective fear, guilt, depression, laziness and weakness. Its ruling planet is Mars. The Nepal variety although rare to find is flat, conical and the surface is smoother and hard. This Rudraksha represents Ardhanareshwar, the combined form of Lord Shiva and Goddess Parvati (Shakti) and blesses the wearer with UNITY. It could be related with Guru Shishya, Parents Children, Husband Wife or Friends. Maintaining Oneness is its peculiarity. Its ruling planet is MoonSeed Mantra :Om Namah. This is ruled by Lord Brahma. The wearer gets power of creativity when blessed. Very effective for students, scientists, researchers, scholars, artists, writers and journalists. Increases memory power, wit and intelligence. Its ruling planet is Mercury.Seed Mantra :Om Hreem Namah Its ruling planet is Jupiter. This is blessed byLord Shiva as Kalagni Rudra. The wearer of five mukhi gains health and peace. Five mukhi rudraksha controls blood pressure and cardiac ailments. Five mukhi mala is also used for Japa. By wearing the mala the wearer’s mind remains peaceful. The wearer of five faced Rudraksha never gets untimely death. Five Mukhi raw beads (which have not received any treatment of color or oil ) are used by soaking in water overnight and then drinking this water on an empty stomach next day morning. The beads are then dried and used again the following day. This has been found useful for blood pressure, diabetes and stomach disorders. Its ruling planet is Venus. This Rudraksha represents lord Kartikeya, the second son of Lord Shiva. When invoked it blesses the wearer with wisdom, increased intelligence, will power and a steady mind. It improves artistic qualities, expression powers and oratory. Good for teachers, students, managers, businessmen, executives, journalists and editors and those who want to improve their speech and charm. Six Mukhi Rudraksha governs genital organs. Apart from necklaces is also worn on the right hand. Its ruling planet is Rahu. This Rudraksha represents Lord Ganesha and it removes all obstacles and brings success in all undertakings. It gives the wearer all kinds of attainments- Riddhis and Siddhis. The minds or intentions of opponents are changed. All those who are seeking wealth should wear this along with 7, 15 or 17 mukhi Rudraksha. It is ideal for persons suffering from diseaes of skin, fear of snake, cataract and hydrocil. It represents Lord Hanuman also known as EkadashRudra. Blesses the wearer with oratory skills, skill of negotiation , self confidence , right judgment, intelligence and power both in mental and physical frames. As this bead also gives the power to control Physical senses , it makes one fearless and therefore is ideally recommended for meditation and devotion to God. It also protects against accidents and untimely death. Good luck and fortune is bestowed upon the wearer. It has no ruling planet. It has no ruling planet and pacifies all negative planetary energy. This contains the influence of ten incarnations and ten directions. As mentioned in old epics like Rudraksha Jabalopanishad , Nirnaysindhu , 10 mukhi is blessed by Lord Yamdev (Lord of Death), and Lord Vishnu. It works like a shield on one's body and drives evils away. Wearer is protected from the influence of evil spirits, ghosts and black magic. This is also suitable for controlling the anger of a person. One wears this by the blessingsof Lord Mahavishnu. One gets the power to concentrate well. Also it aids in devotion andmeditation. To cure insomnia this bead is very helpful. 13 mukhi is blessed by Lord Indra who is the chief of all Gods and as such the wearer gets the blessings of all the Devatas. It gives spiritual attainments as well as all materialistic successes. Many consider 13mukhi as blessed by Goddess Mahalaxmi as well. This bead is also blessed by Lord Kaamdev (Cupid) and it fulfills all desires. When invoked showers all possible comforts of life, one can ever desire. It givesriches and honor and fulfills all the earthly desires.This should be worn by leaders and senior executives and also preachers who have to deliver speeches and are in contact with the masses, this because it improves self performance by improving charm and attraction. Persons desirous of getting recognition as leaders and who want to be victorious should wear this bead. It is the most precious divine gem known as Deva Mani. It is blessed by Lord Shiva . It is said that this has come from the eye of Lord Shiva and has great virtues. It is known as Ajna Chakra (Medula Plexus). This Rudraksha not only improves the present, sets right the past but also makes the future for seen and positive. This bead is also considered as having a form of Lord Hanuman. It is said to give effects in a very short time. It awakens the sixth sense, by which the wearer foresees the future happenings. Its wearer never fails in his decisions. Its wearer gets rid of all the calamities miseries and worries. It provides the wearer safety and riches. It is also worn on the forehead or arm. Those who are in the business of share trading or any speculative business would find this bead very useful. Those in the profession of job placement or who have to recruit people for their own work, will notice that they can judge the person whom they are interviewing more correctly if they use this Rudraksha. If someone is in import / export business and without meeting the persons from the other side and if he/she wants to minimize the risk then this Rudraksha will be of great help in making proper judgments. This Rudraksha is also known as Maha Shani and removes the malefic effects of Saturn planet and also those of Kaalsurp dosha. The person who wears a 14 mukhi can transform himself into the real Param Shiva. This bead is blessed by Lord Pashupatinath. It has all virtues of the 14 mukhi in it and additionally brings luck for getting more wealth. It is beneficial for spiritual enhancement of mind and body thereby giving the wearer full satisfaction and happiness. This Rudraksha is known as “Jai”(Victory) Rudraksha.Its supernatural powers protects the wearer against any theft or cheating. The wearer is always victorious against his / her adversaries. It is dedicated to Lord Ram and therefore has great virtues to become a decent human being with good family relations and earning respect and fame. If there are several odds or unfavorable planets then this Rudraksha helps to overcome all ill effects due to these. This represents Lord Vishwakarma. The wearer notonly gets sudden wealth but spiritual power as well. The sudden wealth may come like sudden rise in share value or property prices, inheritance of unexpected properties or from any game of chance. This Rudraksha gives all four attainments of life, which are Dharma, Artha, Kama and Moksha. This is known as “Bhumi Rudraksha” and Mother Earth is symbolized by this. The wearer remains wealthy and free from all diseases. Ideally recommended for those who are launching a major project, new work of any type or making a change in their business line. Also recommended for women as it protects against premature delivery and also guards her children against disease. This Rudraksha represents Lord Narayan (Vishnu).Itfulfills all materialistic desires and sharpens the business acumen. By wearing this Rudraksha any big work of any nature whether business , serving mankind , politics, any big social activity or any major event in life can be done without stress. The wearer gets generous blessings of Lord Vishnu and gets all luxuries and success in all actions. This bead is one of the rarest to find and represents “Param Brahm” the Supreme Lord where the entire trinity of Brahma, Vishnu and Shiva merge and re merge due to his own desires and will. It is a rare Rudraksha and if one gets it then with great reverence it should be worn or worshipped. This is a Rudraksha which bears a Trunk like elevation as on the face of Lord Ganesha. It is called Ganesha Rudraksha. It provides the worshipper prefection protect and successin every sphere in life and the grace of Lord Ganesha is received by him. Garbh Gauri Rudraksha is another form of Gauri Shankar. In Gauri Shankar both the joined beads have equal sizebut in Garbh Gauri one bead is significantly smaller than the other. It has been seen as the best for those women whosuffer defects in their conceptions and are prone to abortion. They are advised to wear Garbh-Gauri Rudraksha around the neck to gain the pleasure to have issues and to have good family relations. Gauri Shankar is two naturally joined Rudraksha and is regarded as the form of Shiva & Parvati. It is the unified form of the Lord Shiva and the Goddess Uma. It makes the husband and wife identify each other. It is regarded as the best Rudraksha for peace and comfort in the family. Gauri Shankar is considered best for finding the right soul mate, solutions for a delayed marriage and helps in removing obstacles in child birth. This is a wonder of nature where three Rudraksha beads get joined naturally on the tree itself. Also known as Tribhagi, Gauri Path, or Brahma-Vishnu-Mahesh it represents the Trinity of the universe. It is a very auspicious Rudraksha and the wearer gets the blessings of all the three Gods. It represents a complete personality and for a complete command over all situations. It is ideal for effective leadership and complete success.